"Brazilian Day Lunch Goes Beyond the Cafeteria and into the Classroom," read about Island Grown Schools work in the Martha's Vineyard High School. Click here to read. December 2016, MV Times. Program Leader Noli Taylor brought together a group of 10 farm to school leaders from across the state to strategize state level policies that would support farm to school work across Massachusetts. Click here to read more. October, MV Gazette. Local High School students from the MV Public Charter School have been working with IGS and their local representatives to advocate for legislation that supports Farm to School work across the state of Massachusetts. Click here to read more. May 2015, MV Times. “Cranberry Harvest is a Local Success Story”, read about cranberries, October’s Harvest of the Month. Click here to read. November 2014, MV Gazette. Program Leader Noli Taylor writes in the Vineyard Gazette about IGS participation at the 7th National Farm to Cafeteria Conference, June 2014. Click here to read. Program Leader Noli Taylor writes in the Vineyard Gazette about efforts to bring seed education and seed saving back to our agricultural community. May 2014, Vineyard Gazette. Click here to read. “Hope for future generations,” a letter of thanks to all of the people who helped to support the High School garden fundraiser. Letter to the Editor, MV Times, May 2014. Click here to read. At 50 cents a portion, Island eggs are one of the cheapest sources of local protein. Read the Egg Harvest of the Month feature in the MV Times for nutritional information and a recipe. Check the MV Times monthly to learn about each crop. March 2014, MV Times. Click here to read. Island Grown Schools featured in Bon Appetit as one of six best efforts for school lunch in the U.S. October 2013, Bon Apetit. 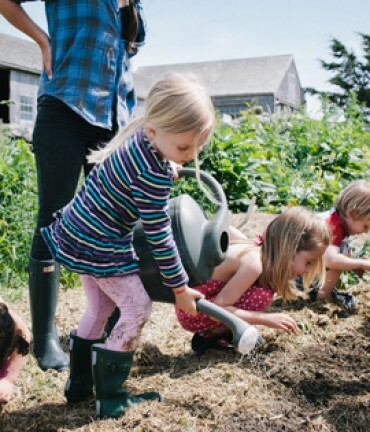 Program Leader Noli Taylor writes in the Huffington Post about the community movement to build a new kitchen at the West Tisbury School and create an independent meals program for the Up Island School District. January 2012, Huffington Post. Click here to read. The Cape Cod Times highlights the connection between MV’s local food system and our public school cafeterias. April 2012, Cape Cod Times. Click here to read. Martha’s Vineyard was the first region in Massachusetts to implement a Harvest of the Month campaign. This Vineyard Gazette article discusses the launch of the program. September 2012, Vineyard Gazette. Click here to read. IGS, Vineyard Nutrition and Mass in Motion collaborate on a Healthy Family Cooking guide. October 2012, Martha’s Vineyard Times. Click here to read MV Times coverage and to find out how to download a copy of the cookbook.